I must be totally crazy or really enjoy what I do to have undertaken this Ambitious Schedule. It's been nearly a month, when on December 23, 2016, the Detroit Red Wings faced the Florida Panthers at the BB&T Center in Sunrise, FL. They're near the bottom of the standings in both Their Division as well as in the Wild Card Race. Before the game at dinner, I told DSBA President Trevor Thompson that My Photographer Candice Ebling and I were covering the Red Wings, then traveling over night to write about the Jacksonville Jaguars vs Tennessee Titans. In Jacksonville, I would see my Great Friend Dan Edwards of the Jaguars. 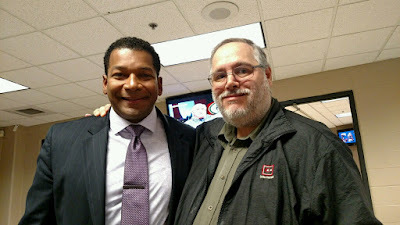 After the Titans game, I told Trevor we were heading to Milwaukee, WI., hoping to arrive by Christmas Night. This would be a trek which would be approximately 27 hours with two sleepless nights. Trevor and I joked around about this and we laughed when Thompson, like most normal people, knew that taking long drives especially like this, aren't his style. As things would turn out, Ebling and I would log over 4,100 miles in a two-week span. We had to replace two rear tires on our rental car, one of which occurred as a result of a blowout as we exited I-94 near West Allis, WI., 30 minutes after we dropped off My Cousin Cindy Cullen Spyke from the Milwaukee Airport. On our trip back to Florida, we dealt with frozen windshield wiper fluid because our company had put a lighter and not strong enough brand in because of freezing temperatures. But back to the Red Wings vs Panthers game. The Red Wings 4-3 shootout win over Florida Fueled My Adrenaline to making Part One of "The Drive" an Easy One. Against Florida, Detroit was faced with some interesting story-lines. With a win over the Red Wings, Panthers Goaltender Roberto Luongo was looking to move into sole possession of fifth place passing Detroit Hall of Famer Terry Sawchuk with 448 wins. But that didn't happen as Red Wings rookie net minder Jared Coreau recorded his first NHL triumph over his hero Sawchuk growing up. I was impressed with Coreau because many young players don't follow the history of their sport as this kid did. Luongo is one of the few goalkeepers in the NHL who still wears the No.1 as that number is retired in Detroit. Coreau would have to earn his win the hard way in a shootout. His record improved to 1-1-0, while Luongo dropped to 11-10-3 for this season at that time. This would go down as Coreau's 1st career win in the NHL. Luongo would have to wait another night to surpass Sawchuk. Since that night, Coreau has asserted himself as the back-up goalie to Petr Mrazek going 5-1-2 with a 2.79 GAA and a .904 save percentage and two shutouts, as Jimmy Howard has dealt with injuries. If the Red Wings would have lost to Florida, it would have been the first time ever they would have been swept by the Panthers. So Detroit indeed avoided this first in franchise history. Florida won the season series 3-1 and trails the all-time series 15-17-5-3. This turned out to be a painful loss for Florida as Niklas Kronwell knocked out Reilly Smith with a clean hockey hit. Smith went on concussion protocol and was out until after the holiday break. Red Wings Coach Jeff Blashill had a successful challenge which saved Detroit from trailing 4-1 as Nick Bjugstad was standing in the crease in front of Coreau, thus that goal was disallowed. One thing which stood out in the game was Florida had an interesting trivia question to their fans. They asked, who was the first 50 goal scorer in Red Wings history? Two of the choices mentioned were Red Wings Announcer Mickey Redmond and Danny Grant. Redmond was the correct answer. When the contest was over, Blashill's body language looked like a coach who was relieved that his team came away with a win knowing the injuries were mounting on his squad, yet refusing to use this as an excuse for Detroit's struggles. The Red Wings passed the 200 man games lost due to injury during their 1-0 OT loss to the New York Rangers on Sunday at the Joe Louis Arena. In this game, both Thomas Vanek (lower body) and Dylan Larkin (upper body) suffered injuries. Blashill reiterated to me what he said earlier in the season, "Every player in the locker room has belief in one another. We'll continue to work hard towards our goal to reach the playoffs." "We don't worry about what other people say outside the locker room. As long as we work hard, the results will take care of themselves." Up the Road Five Hours North on I-95 in Jacksonville, FL., the Jaguars had high expectations when they faced the Green Bay Packers during opening week on September 11, 2016. When we came here, both teams played in tremendously hot and humid temperatures. The Jaguars lost to Green Bay 27-23 and 16 weeks later, Coach Gus Bradley was out of a job as the team had high expectations. Bradley was ousted from his position with a 2-12 record. He finished with a 14-48 career mark with Jacksonville. 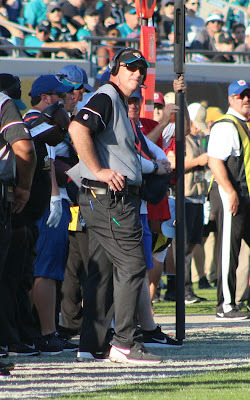 Bradley was replaced before our game with the Tennessee Titans on an interim basis by Assistant Head Coach-Offense/Offensive Line Coach Doug Marrone. Marrone, 52, led the Buffalo Bills to a 15-17 record as head coach from 2013-2014, and is the sixth head coach in Jaguars history. Marrone departed Buffalo because he didn't want to work with the new ownership, consisting of Terry and Kim Pegula and the infrastructure of the front office. As it turned out, the Titans game at home and the finale on January 1, 2017 at Indianapolis, were Marrone's audition to get the permanent job. When we were there, former Coach Tom Coughlin was being considered a candidate to return as coach while there would be other interviews. Marrone passed his first audition with flying colors with Owner Shad Khan watching from his suite. Marrone hit a Grand Slam as Jacksonville thrashed Tennessee 38-17. The Jaguars avenged a National TV 36-22 loss to Tennessee on Thursday October 27, 2016. Jacksonville's victory on Christmas Eve over their former Coach Mike Mularkey saw the 8-7 Titans eventually get eliminated from playoff contention. This was a costly loss for Tennessee as it lost QB Marcus Mariota to a Fractured Fibula for the season. During the Post-Game Press Conference, Marrone did everything in his power to avoid talking about the coaching search, preferring to praise former Jaguars Coach Bradley's influence on the team instead. Candidly speaking, Marrone had as many moves as former Detroit Lions Hall of Fame Running Back Barry Sanders pertaining to the coaching search. However, I did manage to ask him what it was like being on the sidelines again? "I probably felt---my wife asked me the same question. 'How do you feel?' I said, I feel great. I really do," Marrone said. "I feel alive in practice and not that I wasn't before in my other position. I feel comfortable. "I've been a head coach for six years, four in college and two in the NFL. For me, I don't want to say it's like riding a bike because that would lessen that position as a head coach, so I'm not going to go there." Marrone added, " But I felt great. I thought the communication was outstanding. Again, the challenge for me was the communication with defense, the communication with game management, the communication with special teams. "Trying to get coaches up to speed on how I communicate and how I want to run a game, I thought they were great." The Jaguars lost their final game to Indianapolis 24-20 in Indiana. But there was no doubt they were a different team and played much better with Marrone at the helm. Marrone finished his interim stint with a 1-1 mark. The Jaguars finished the regular season with a 3-13 record. 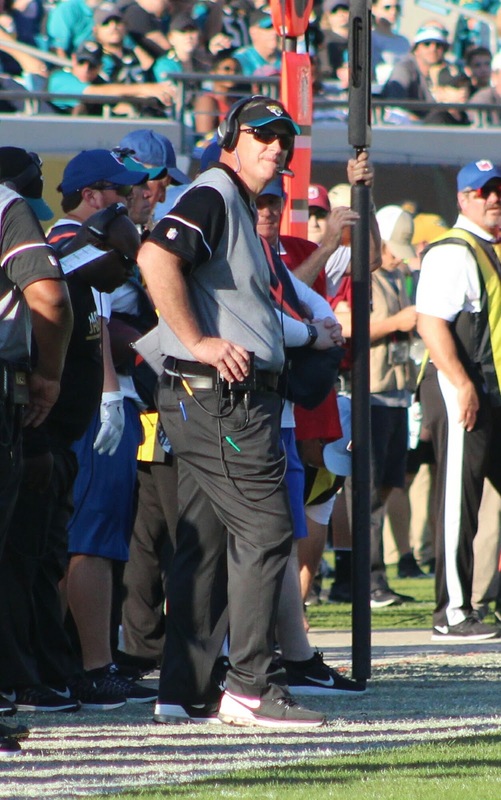 During the off-season, Coughlin was hired as Executive VP of Football Operations. Coughlin wasted no time hiring Marrone and gave him the full-time head coach job. Most recently, former Michigan Wolverines running back and later running backs coach, Tyrone Wheatley Sr. was hired by Jacksonville for the same position. The future does look bright for Jacksonville and I look forward to seeing a couple games next season and monitor their progress. Bradley wasn't out of work long as he's now the new defensive coordinator for the Los Angeles Chargers. Meanwhile, the Red Wings no quit demeanor has them battling to get into the playoffs. GM Ken Holland awaits to get his injured players back and isn't ready to give up on a 26th consecutive playoff berth as Detroit plays its Final Season in the Joe Louis Arena and moves into Little Caesars Arena next fall. The Red Wings are currently 20-19-8 as of this post. The Weekend's All-Star Break couldn't have come at a better time for the team which wears Red and White. As for Myself, We arrived in Racine, WI at 1:30 pm Central Time and that 27 hour drive I told Thompson amounted to 21 hours. Aside from gas and meal stops, the only break we had was a productive stop at the Jaguars game vs the Titans being with My Buddy Dan Edwards. At 54-years old, I'm a Bullheaded Road Warrior with plenty of long distance driving left in me. But I'm with you Trevor, you're still more normal than me, however, I wouldn't have it any other way!